The Sutton Coldfield estate which once belonged to Simon Parratt was purchased by Emmanuel College, Cambridge in 1594, using money bequeathed to the College by Sir Wolstan Dixie. The annual rent from this “Dixie” estate of £30 was to be used to found two fellowships and two scholarships at the College. Simon Parratt continued as the leaseholder of the estate, collecting rents from his subtenants but failing to pay the annual rent due to the College. The College received no rent for the first few years, as Simon Parratt had pledged it to some of his creditors; the College took legal action and established their right to receive the rents from 1598. However, the collection of the rents from the tenants was no simple matter, as it appears that Parratt (who died in 1597) had made special arrangements with many of them; the sudden imposition of the full rent payment caused great hardship. Thomas Gibbons, a former Warden of Sutton, wrote to the College in 1598 asking that the tenants be dealt with leniently. Robert Blakesley was particularly harshly treated. He held an Inn in High Street called the White Hart and land in Maney, but refused to pay the demanded rent because it was more than had been agreed previously. Richard Sharp and Alexander Brazier, two Sutton yeomen, (Sharp was Warden in 1603) wrote to the Master of the College, reporting the arrest of Blakesley for non-payment of rent of the White Hart. The next letter in the College deed box is a complaint from Blakesley, witnessed by other tenants, about his imprisonment and loss of goods; in a further complaint he asks to receive the rents from the “persons dwelling in the White Hart” to recoup his losses. In the same box is a memo dated May 3rd 1601 of rent due from John Holt of the White Hart and of further rent payable by William Porter, Anthony Careless and Goodwife Cooper, who live there. Archive box 29 at Emmanuel College contains eighty letters and notes from this period, 1598-1602. John Heath, the master of Bishop Vesey’s Grammar School, wrote about the Blakesley issue, and another three letters about John Saunders of Maney Farm. Saunders seems to have been helpful to the College at first, but was complaining to the College about his unfair treatment in 1598. On May 4th 1601 Saunders was reported to be “very ill”, and on August the 10th 1602 his son Francis Saunders wrote to the Master of the College about the wrongs done to his mother and the general ill-treatment of the inhabitants. Millicent Saunders asked Sir Antony Mildmay to intervene on her behalf. Emmanuel College had opened its doors in 1588, founded by Sir Walter Mildmay; Sir Antony, his son, returned to England from having been ambassador to the court of King Henry IV of France in 1598. Several letters in the archive box are from him, asking the College “to relieve the complaints of the tenants” and to “take care not to wrong the tenants”. The letters refer to several other tenants; Robert Ireson, Thrustancius Lowe (a carpenter, tenant of the Old Smithy in Birmingham Road), John Bull, Thomas Wright, William Pittman, William Underhill (whose blacksmith’s shop was in Mill Street), Richard Higgins (he was fined £10 in 1601 for shooting a bittern on April 19th with his crossbow), and John Holt “who should continue tenant as the town needs them”, his wife being a good midwife. 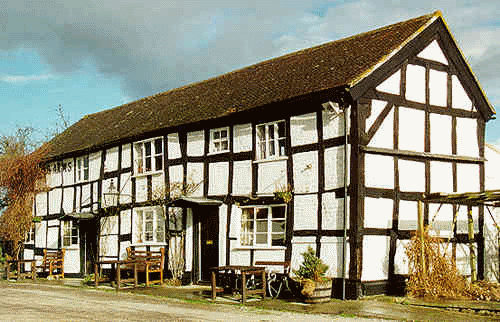 The “White Hart” inn probably looked something like this Worcestershire pub. 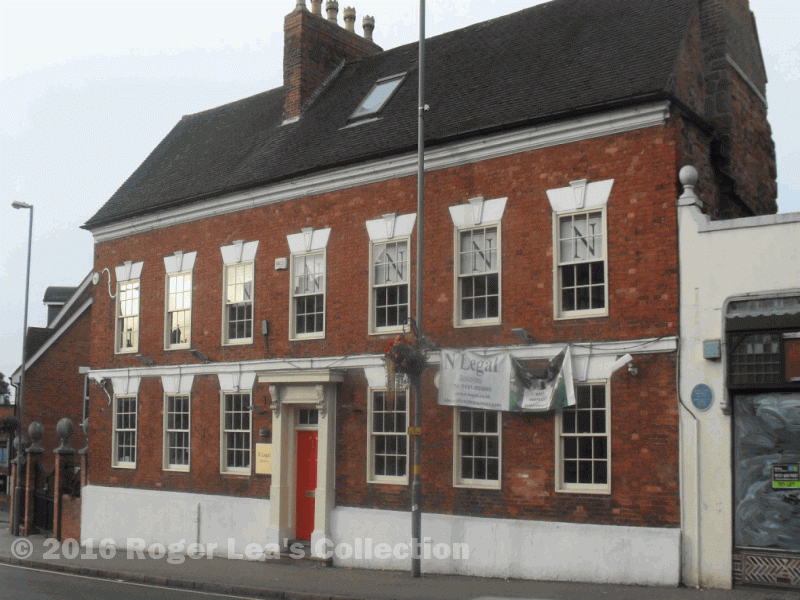 “N Legal”, 1-3 High Street, now stands on the site of the White Hart.